As a freelancer, independent contractor, sub-contractors, or any self-employed person offering services to others like actors, you need to create invoices to get payments in time. 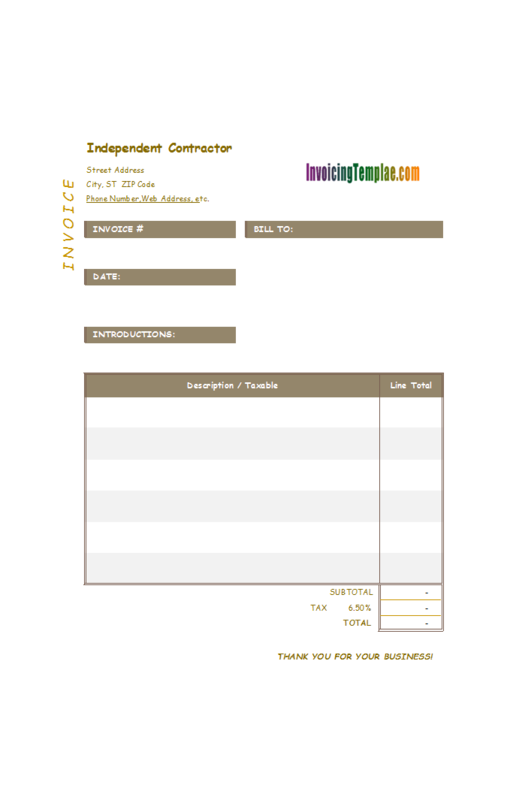 Creating invoices using Independent Contractor Invoice Template is as easy as fill in a blank paper form. c2032 now includes the customized invoice template for the latest version of Invoice Manager for Excel. This is what you will see when you open independent-contractor.xlsx. No matter what your contractor or freelancer service is, a professional and beautiful invoice gives your client a good impression that you are caring about your business. 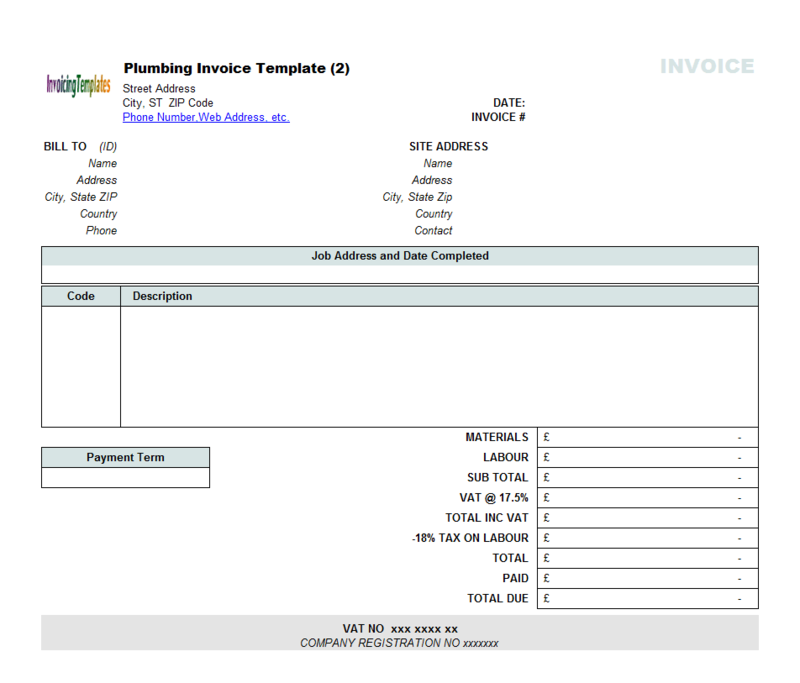 We've already published a number of free invoicing templates / billing formats that you can choose from, like those in the service invoice template and consulting invoice template categories, or the specific ones like Contractor Billing Format (c3009), Plumbing Contractor Invoice Template (Landscape) (c2009), Parts and Labor Invoice Template (c4071), Website Development Invoice Template (c2024), etc. Effective invoicing procedures are crucial to the financial health of all contractor limited companies. 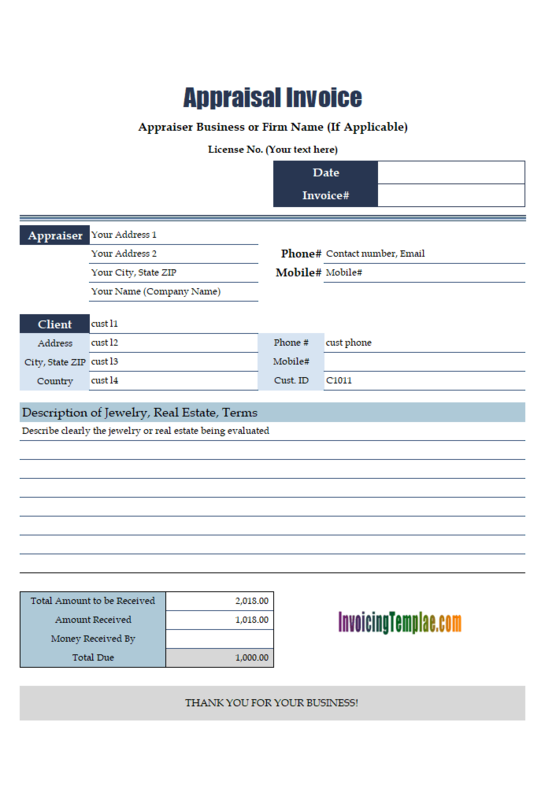 So here we are offering a new invoice sample for independent contractors. 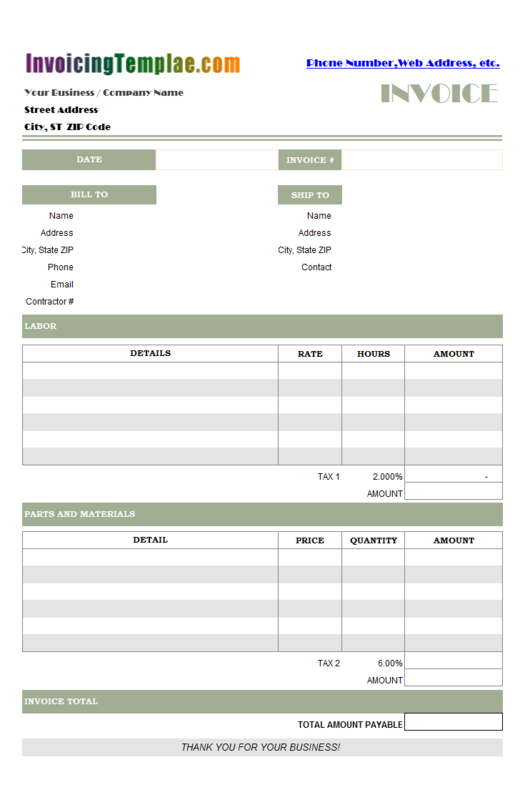 Note that this template, like all the other templates published here on InvoicingTemplate.com, works or without installation of Invoice Manager for Excel (namely Uniform Invoice Software). 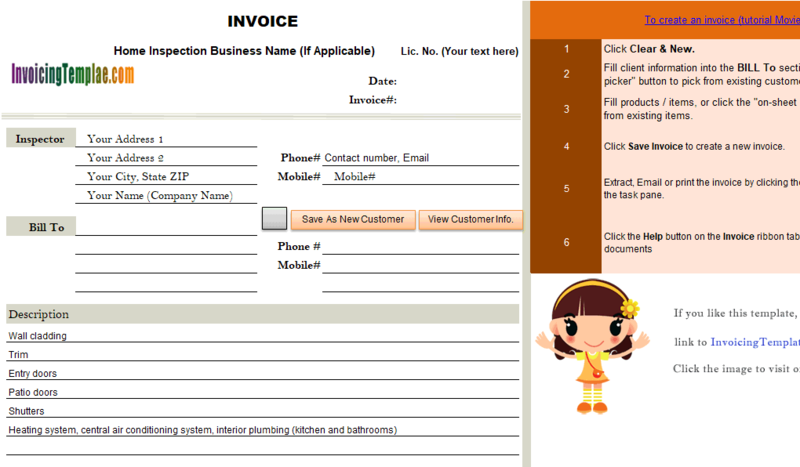 No matter what contractor service you are offering - web and graphic design, plumbing, construction, photography, copywriting, computer programming, website development, consulting, video production, translation, etc., you can use this template without installing Invoice Manager for Excel (namely Uniform Invoice Software) to create contractor invoices. 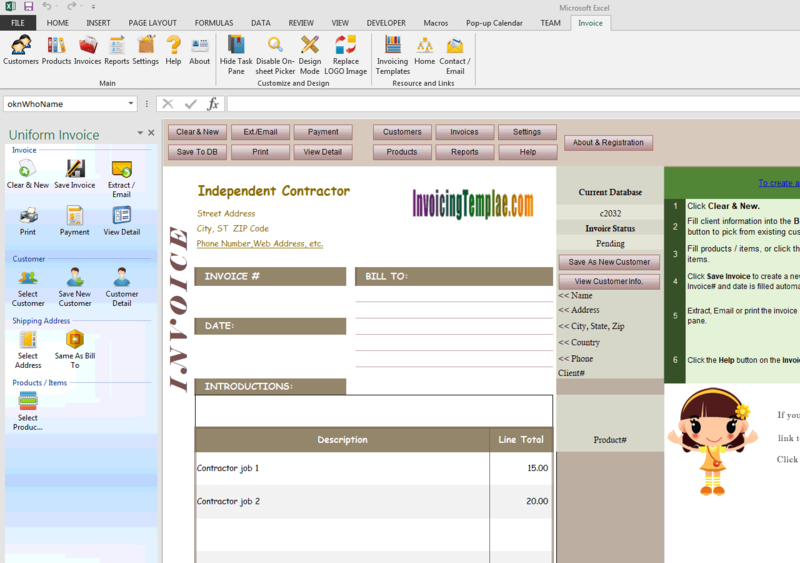 However if you install Invoice Manager for Excel (namely Uniform Invoice Software), the pure-Excel invoice template becomes a powerful invoicing software, offering a number of powerful time-saving features, such as automated invoice numbering (generate unique and sequential invoice numbers based on previous invoice#); quick and easy picker for customers, products and invoices using any criteria available that enables you to locate the data you want to use in no time; and the flexible reporting features, with which you can have sales report, product report, customer statement, payment report etc. with just a few mouse clicks. 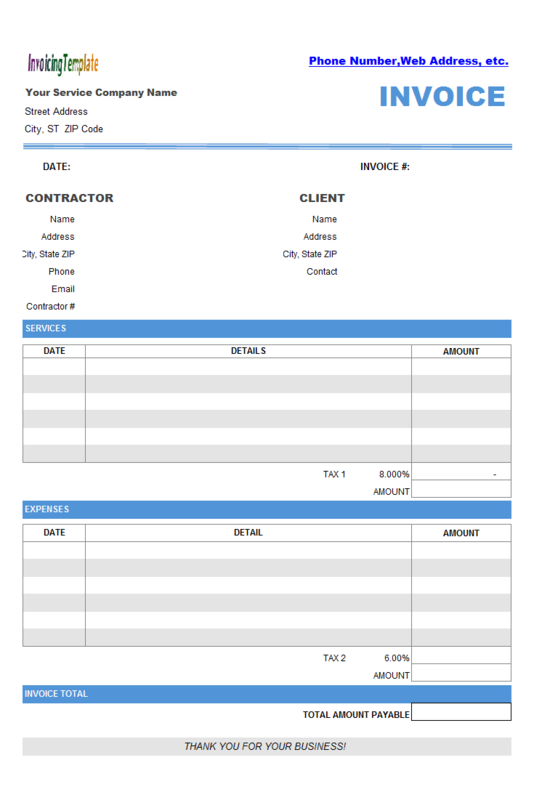 With this design of the contractor invoice template, we used an unusual font, "Comic Sans MS", (at least on the invoice forms here on InvoicingTemplate.com, we don't use that particular font frequently). However with just a few clicks of mouse, you can change the font type, as detailed below. First backup your template. Although we are going to do a simple customization, backing up the template before modifying it is still recommended, especially if you are not very familiar with Microsoft Excel. 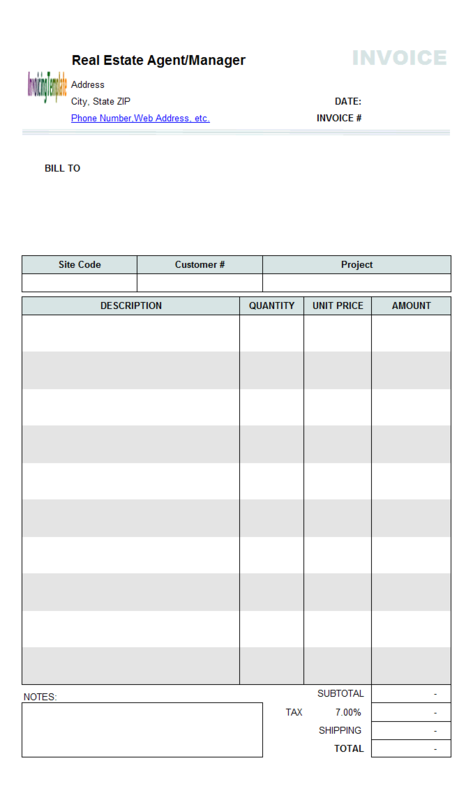 Open the contractor invoice template as usual. 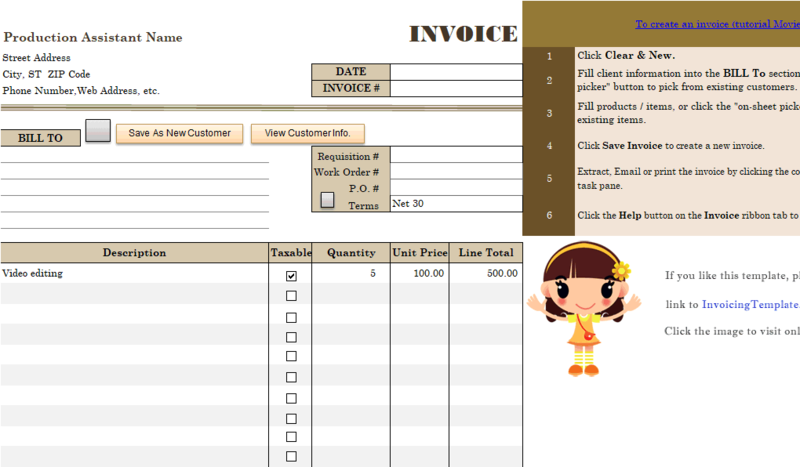 Click the "Design Mode" button on the "Invoice" ribbon tab to switch the "Invoice" worksheet into design mode. This mode allows you modify the formulas, layouts and designs of the template. From the name box located on the left-end of the formula, click the "Down Arrow" to expand the list. From the bottom of the list, choose "Print_Area". 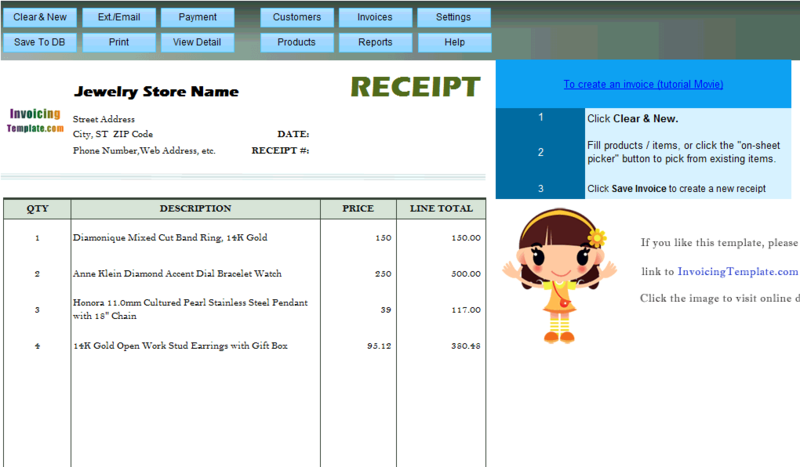 Excel marks all the cells inside the printable invoice form as selected. Go to Excel "Home" ribbon tab. From the "Font" command group, pull down the font drop down list and choose the font you like. All cells that are selected (i.e. 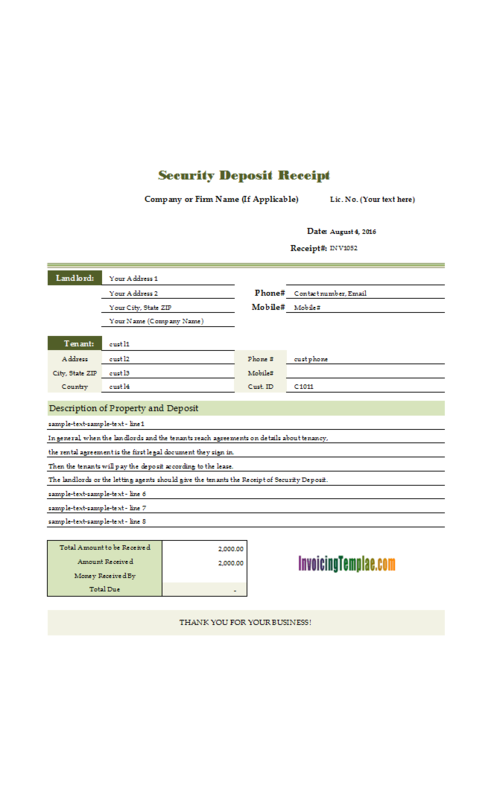 all cells that are inside the printable invoice form) will use the font you choose. Exit design mode by clicking the "Design Mode" button on the "Invoice" ribbon tab again. Save the template by clicking the "Save" button on Microsoft Excel quick access toolbar. 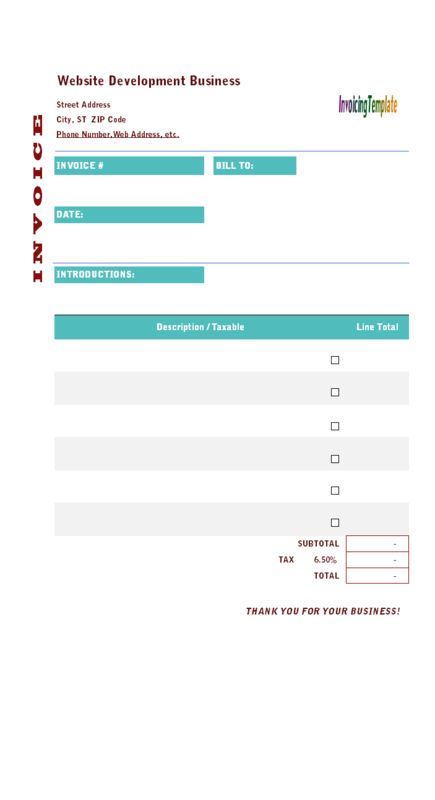 This billing template has one tax set by default, and by assuming all items that are invoiced are taxable, it removes all the "Taxable" checkbox. The tax amount is calculated based on "oknSubtotal" (the sum of all item amounts), instead of "oknTaxableSubtotal" as found in the default invoice template shipped with Invoice Manager for Excel (namely Uniform Invoice Software) installer program). To setup your taxing options and rules, click the "Settings" button on the "Invoice" ribbon tab, and then click the "Settings" button, go to the "Taxes" tab, where you can find options for the number of taxes, tax names, tax rates etc. 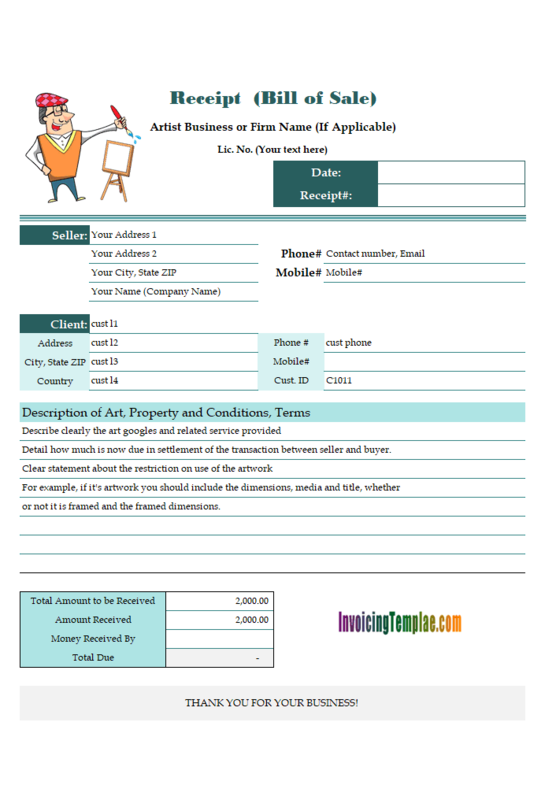 For more variants of our templates designed for special taxing requirements, visit taxing invoice templates. Other elements of invoicing are down to personal preference however. Some contractors and freelancers prefer to submit their invoices in pdf format to make alterations difficult. 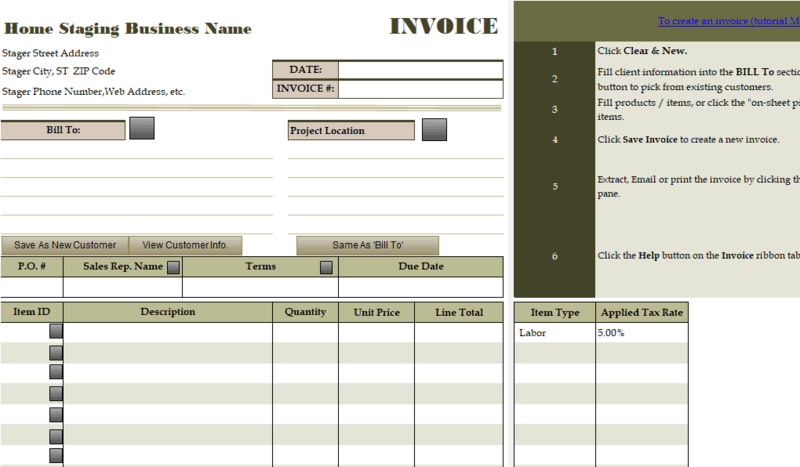 Invoice Manager for Excel (namely Uniform Invoice Software) is able to generate contractor invoices in PDF format too. 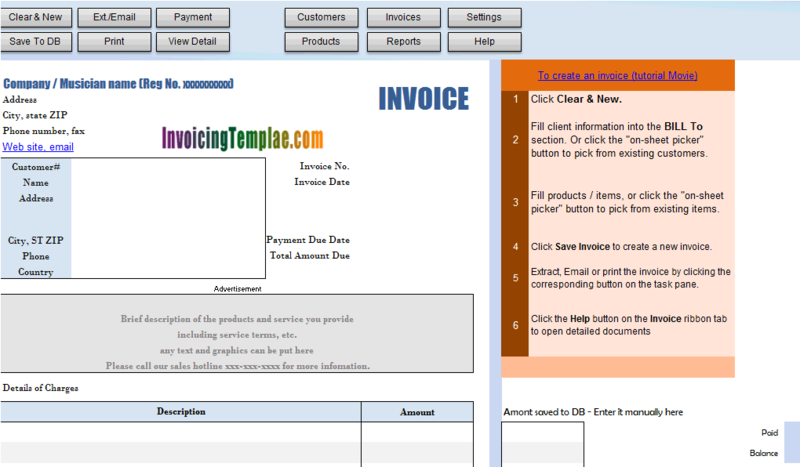 Feel free to take a look of our indexes of all PDF invoice templates. 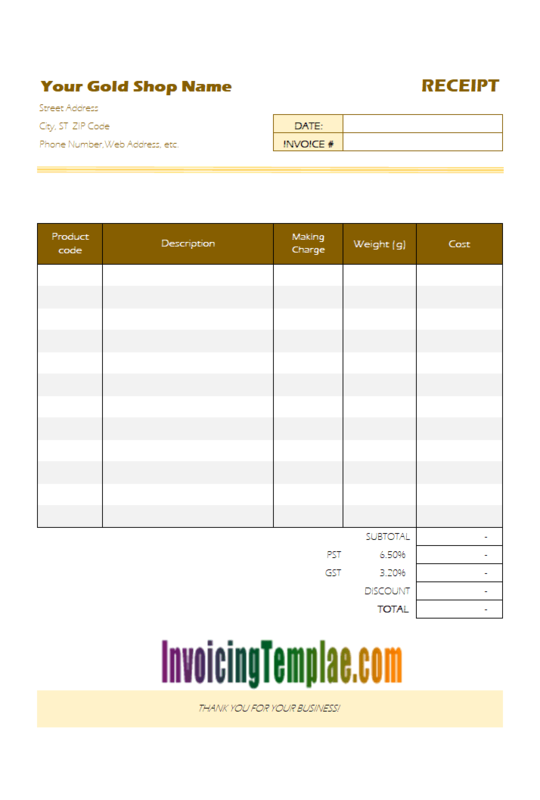 Like other form designs here on InvoicingTemplate.com, Independent Contractor Billing Format is free (offered to you at a price of 0.00USD). It works on Windows XP and all newer versions of Windows, and Excel 2007, 2010, 2013 or 2016.